Booking a ticket to Manipal was quite a confusing decision. The purpose of going to Manipal was to attend a two day conference there. My colleagues and some of my students were traveling along, and I had to take into account their convenience as well. While I was personally inclined to try a Volvo, they seemed to prefer a non-AC sleeper instead. This was my first opportunity to try one, as well. I got in touch with a old timer busfan friend, who suggested Anand Travels to me. I got tickets reserved through him as well. The bus, conveniently, had a pick-up point near my home as well. I reached home quite late from office, and I realised that my pick-up was at 2015hrs quite late. I had to rush with dressing and packing for the two day program. I received a call from the crew of the bus sometime around 2000hrs, informing that the bus wouldn't come to its normal pick-up point due to some road work, and I had to stand a little away from the pick-up place. I responded that I am coming from the opposite side and requested him to remain wherever he was parked. I rushed out of home - couldn't find an autorickshaw anywhere near, and had to trudge all the way to the auto stand with my baggage. Auto guys in Bangalore routinely refuse if the ride is short - but me being a regular at the stand, a guy immediately agreed to come. I was at the bus about 5 minutes past the scheduled departure time. The bus finally started off their parking in Vijaya Bank Layout off Bannerghatta Road in South Bangalore at 2023hrs - 7 minutes late [delay was due to me being late]. We headed straight to Bannerghatta main road. 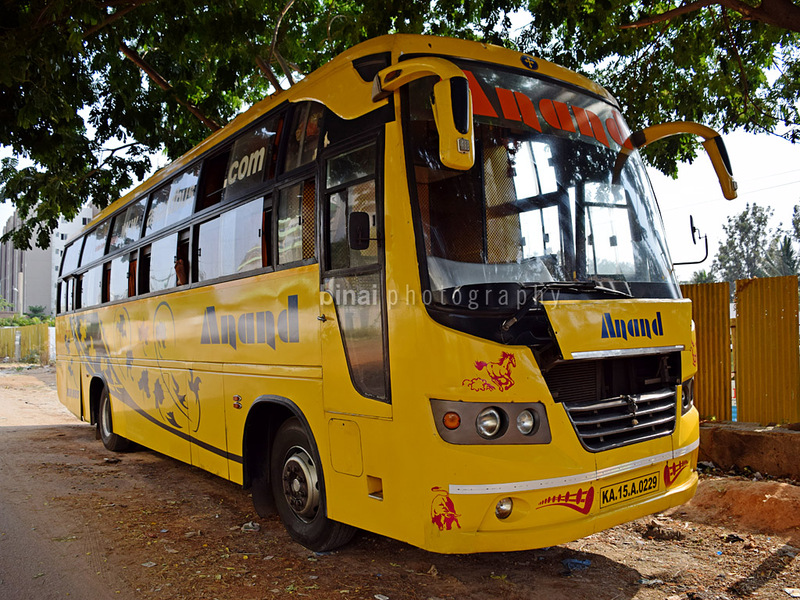 The bus, KA-15-A-0229 was a 2014 model Ashok Leyland Viking bus. The body appeared to be from one of the many Rajasthan body builders - Surendra, maybe. The ride quality was very good, and the berth space seemed very good. I was in berth #1, the first single lower berth. There was no space to keep bags or footwear below the berth - a fairly big shelf was provided near the berth to leave small bags or footwear on it. The bus travelled through Bannerghatta road, then turned towards East end circle at Jayadeva grade seperator. 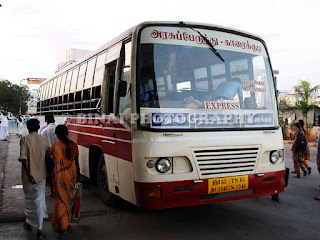 Then we traveled straight towards RV Road, then turned towards Basavangudi at Southend circle. We had a couple of pick-ups at Nagasandra Circle, and then turned towards Gandhinagar. We reached Gandhinagar sometime around 2127hrs. The berth was fairly comfortable - a pillow was provided as well. The berth had a backrest at the head-end of the berth. This meant one could sit comfortably on the berth without hurting the back. I had brought a shawl from home, and it was quite cold outside. I left a small opening in the window for ventilation. The driver maintained stable pace and drove quite well. I slept in no time, and did not realise anything that happened outside. I vaguely remember seeing the bus stopping somewhere for a break. The attendant kept calling out places on the way - and quite a lot of people got off as well. I remember the attendant calling out "Mangalore Last Stop" at one point - the time was around 0515hrs then. He meant that say that it was the last stop in Mangalore. I slept for some more time, and woke up just when the bus pulled out of the highway, and entered a small road. The bus parked inside a small garage at around 0550hrs. That was Anand Travels' garage - they unloaded most of the luggage here. I checked GMaps and found that we were somewhere near Mulki then. The bus started from the garage sometime around 0601hrs. Our next stop was at Padubidri, to drop a passenger (0611hrs). I slept for sometime after Padubidri. The bus stopped somewhere on the way, once again, to unload some more luggage. We reached Udupi sometime around 0650hrs. I got up finally as we left Udupi. The attendant also came around to wake up all the passengers in the bus - Manipal was his destination. We were finally dropped at Tiger Circle, Manipal at 0655hrs - well before his scheduled arrival time of 0740hrs! The overall ride was great. The driver appeared a bit hurried on the ghat section - the turns were taken at good speed, and I did have a roller-coaster experience there. The bus was in great shape - inside out. A casual peek at the odometer showed a reading of around a lakh kms. The engine appeared very relaxed - meaning the overall driving habits were sane. There was absolutely no use of horn anywhere through the journey. The ride quality was also good. Except the ghat section, the experience was great. I may not prefer a non-ac sleeper again - for the sole reason that I prefer a controlled temperature. It got very stuffy when the windows were closed, and it was terrible when the windows were opened. The journey would've been more comfortable had it been an AC sleeper, for sure. Entertainment: Available, Songs were played till pick-ups were over. Will I take this service again? I am not a regular on this route. The service was great. I personally don't prefer non-ac coaches though. Surely a recommended service. 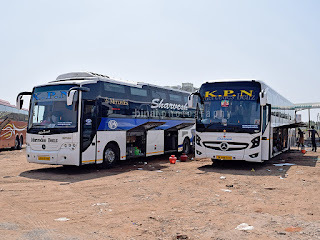 I am a frequent on the Mangalore Bangalore routes. 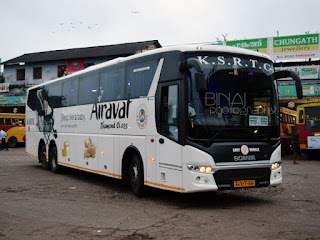 The Airavat Guys do a fab job. Excellent driving and they always reach early! Not to mention the fantastic driving on the Ghats !